This is an stunning original production cel from the Walt Disney Studios animated feature, Snow White and the Seven Dwarfs (1937). 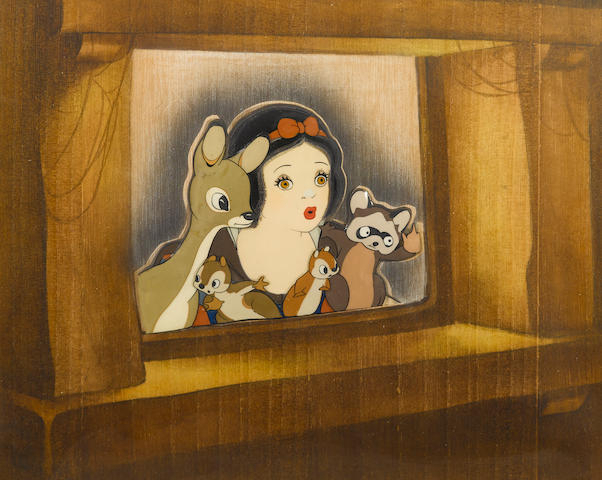 This wonderful hand-painted cel features the iconic image of Snow White and her animal friends as the stare in amazement into the home of the Seven Dwarfs. This hand-painted cel was created at the studio and used during production, representing an actual frame of animation that was photographed and appears in the film. This cel is in great condition and has been trimmed and applied to a custom wood veneer background as it was originally prepared by the studio for the Courvoisier Galleries. The piece measures 19" x 20 images framed and the above imagery measures 7.25" x 9" through the mat opening. An absolute treasure, featuring iconic Snow White imagery.